STERLING SILVER BRIDAL SETS : LOVE2HAVE in the UK! The BEST! 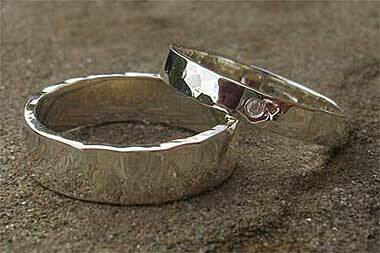 British sterling silver bridal sets and matching wedding rings all with special discounts available. We decided to make this category into a mix and match of various styles of wedding and engagement rings. Some are plain while others come set with stones such as sapphires and diamonds. As you can see the stone set rings come pictured with a matching plain version, and it is these that you can specify to suit your needs regarding styling, widths, and finishes. All of the engagement rings above feature in our UK made engagement rings section of our site, but we have collected them together in this single section for your convenience as we know how popular wedding and engagement sets are becoming. By grouping the rings, you are saving money from having to buy them individually. We have reduced the prices for multiple purchases, and if you are considering three rings, for example, the third ring for his wedding ring, then we may be able to offer you a further discount, so please do feel free to contact us as special discounts may be available!